In 2016, a grand mal seizure sparked a wave of curiosity into the CBD world out of desperation. Pineapple Express, a well known weather pattern (atmospheric river) stemming from the South Seas bringing heavy rains to California, or a common cannabis strain the Pineapple Express movie made popular is your first thought. 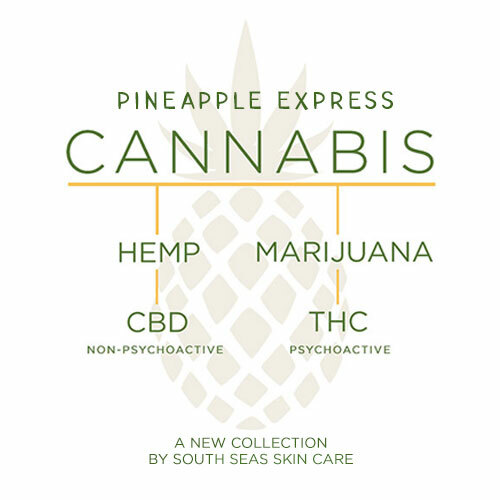 Actually, Pineapple Express is our new CBD Collection by South Seas. Made from the highest quality organic full spectrum CBD, Pineapple Express was designed with precision to offer a holistic alternative to healing. Our two topical products, developed for medicated skin care preparations and self-tanning preparations, blaze the trail for the rest of the line: Body Butter will combat eczema, psoriasis and dry skin & Joint Balm that will make you forget your pain. Our new Pineapple Express Gold hemp oil CBD drops can be added your skin/body care products or taken sublingually. Pineapple Express Clear, a water soluble CBD tincture can be added to your favorite beverage, bath or tanning solution. CBD stands for cannabidiol. There are two strains from the Cannabis plant. Hemp and Marijuana. Our hemp sourced CBD is full spectrum with an entourage of positive side effects. Organically sourced from hemp, rest assure you will not feel a buzz – just positive healing from mother earth. Cannabis works with our endocannabinoid system present in the brain, gut and central nervous system. The human body has receptors that only accept cannabidiol (CBD) and tetrahydrocannabinol (THC) making it the perfect healing path.